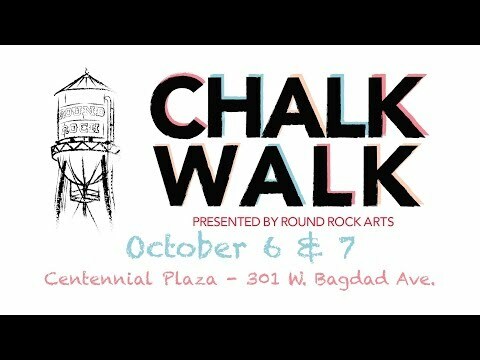 Chalk things over with Round Rock Arts at their annual Chalk Walk on Friday, October 5 and Saturday, October 6, the city's largest and most prestigious festival for the arts, drawing tens of thousands of people to downtown Round Rock over the course of two days. The highlight of the event are the hundreds of artists who showcase their amazing talents by creating beautiful sidewalk murals. In addition to the sidewalk chalk murals, the Chalk Walk Arts Festival will showcase tons of local artists and artisans, community performers, nonprofits and businesses. Plus, this year the Chalk Walk will be rolling out new children’s activities in the Sprouts Kids Zone, youth performances on the School of Rock stages and a concert on Friday and Saturday night! The event is FREE to attend and will take place on Friday, October 5 at 5:00 p.m. to 9:30 p.m. and continues on Saturday, October 6 from 9:00 a.m. to 9:30 p.m.
For more information, please visit here or contact Round Rock Arts at 512.218.7099 or info@roundrockarts.org.